Another stop en route to Norwich was Bury St Edmunds primarily to see the Abbey and the Abbey gardens, but when we got there we were enticed into the cathedral instead. 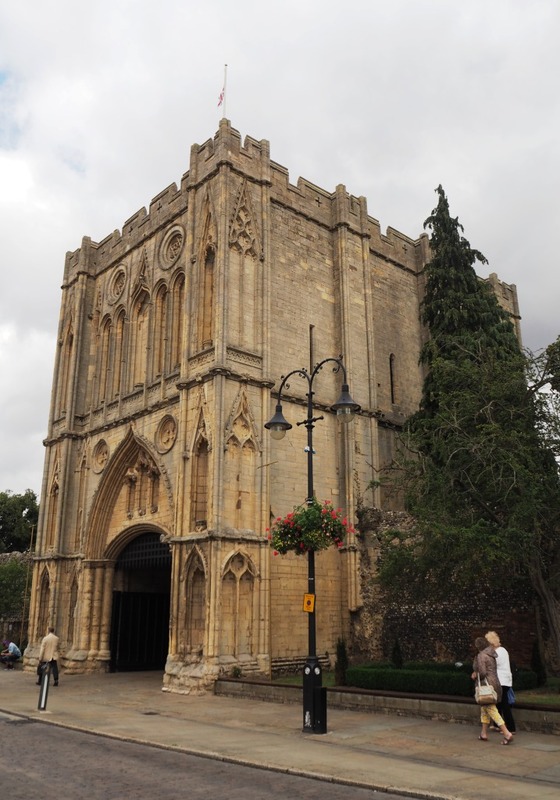 Bury St Edmunds grew up around the powerful Abbey of St Edmunds in the Middle Ages. For 500 years pilgrims came from all over the world to worship at his shrine. After the Dissolution of the Monasteries (yep – good ole Henry VIII again), the abbey church – one of the largest Norman buildings in Europe – fell into decline. But before I take you into that wonderful building here’s a glimpse of the Abbey and surrounding area. 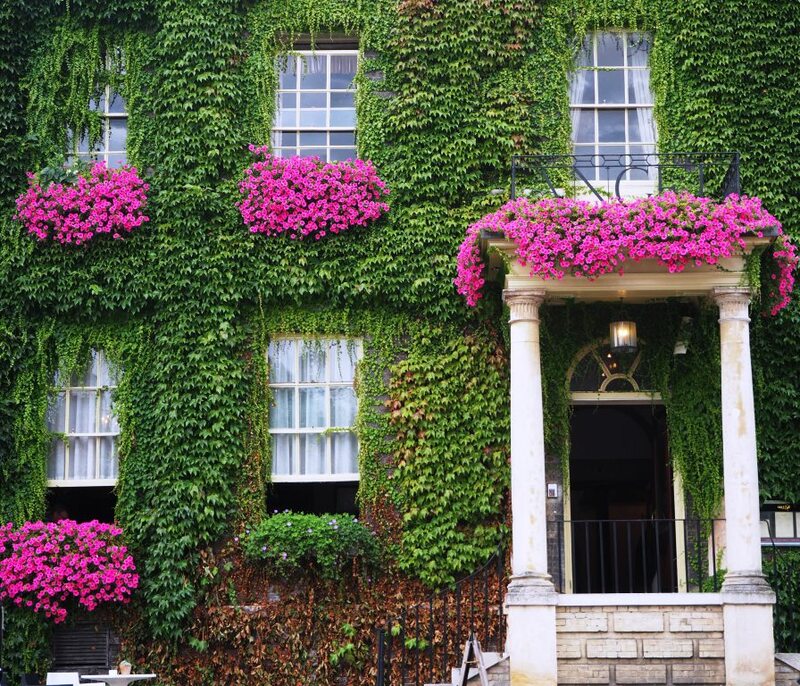 We parked in Angel Hill, a cobbled square which is opposite the Cathedral and the Abbey Gate and in front of the very colourful Angel Hotel (above). When I drive through historic places like this I always feel guilty – cars ought not to be allowed, just pedestrians and maybe a horse and carriage. The Abbey Gate stands at the entrance to the Abbey Gardens and is part of the perimeter wall of the former abbey. The original gatehouse was destroyed by an uprising of the local people in 1327 and rebuilt in 1347. The Abbey Gardens were created within the walls of the former medieval monastery and a mixture of bedding plants and quiet corners in which to relax. The park was laid out as a botanic garden in 1831 and opened to the public in 1912. The best time to see it is spring when 40,000 bulbs are opening. I will write more about the gardens on my Earth laughs in Flowers blog next month. The old walls can still be seen around the back of the cathedral and behind the Norman Tower you can see the arches of the west front of the former abbey, which have been built around to create houses. 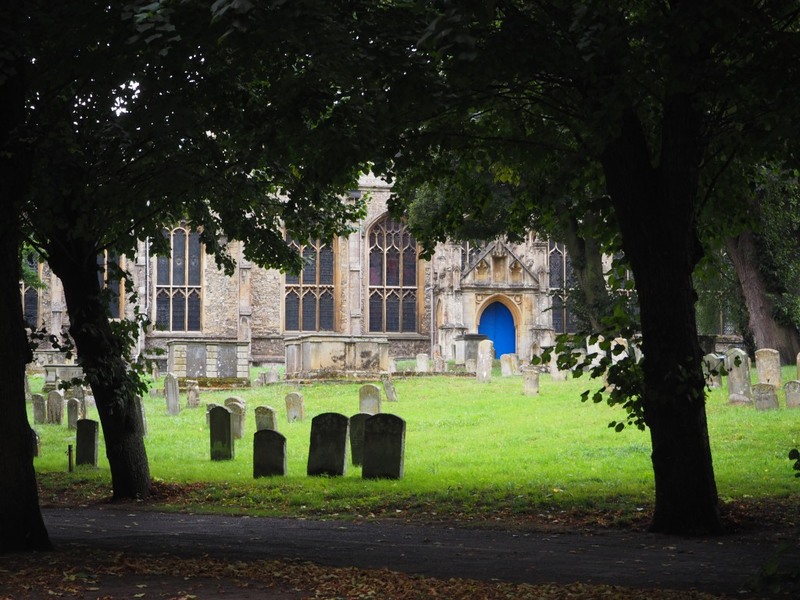 Between the West Front and St Mary’s Church is the Great Churchyard which contains many ornate and carved tombstones. St Mary’s was built between 1290 and 1490 as part of the abbey complex. We didn’t have time to go inside, but it is the third largest parish church of the county and has a unique hammer beam ‘angel’ roof. Mary Tudor, sister of Henry VIII is buried here. 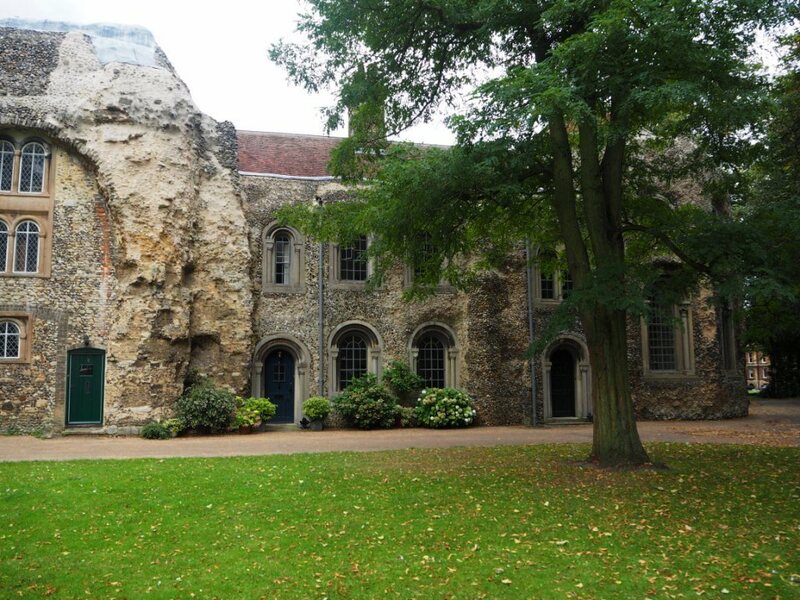 At the bottom of the green is another tall building, the Norman Tower (St James Gate). Built between 1120 and 1148 as a gateway to the abbey precincts. It houses the bells to the nearby cathedral and is the best preserved of the former abbey buildings. And I know someone will be wondering what on earth the wolf sculpture is all about. It is part of the Wolf Trail inspired by similar art trails across the UK, such as the Norwich Gorillas and Chester Rhinos. 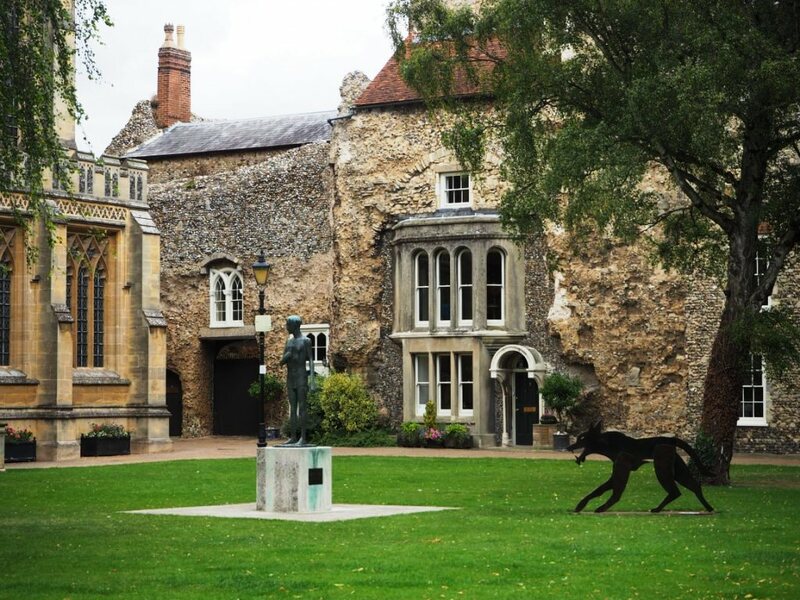 The wolf was chosen for Bury St Edmunds due to the connection with the Edmund story; it is said a wolf guarded Edmund’s head after his martyrdom. 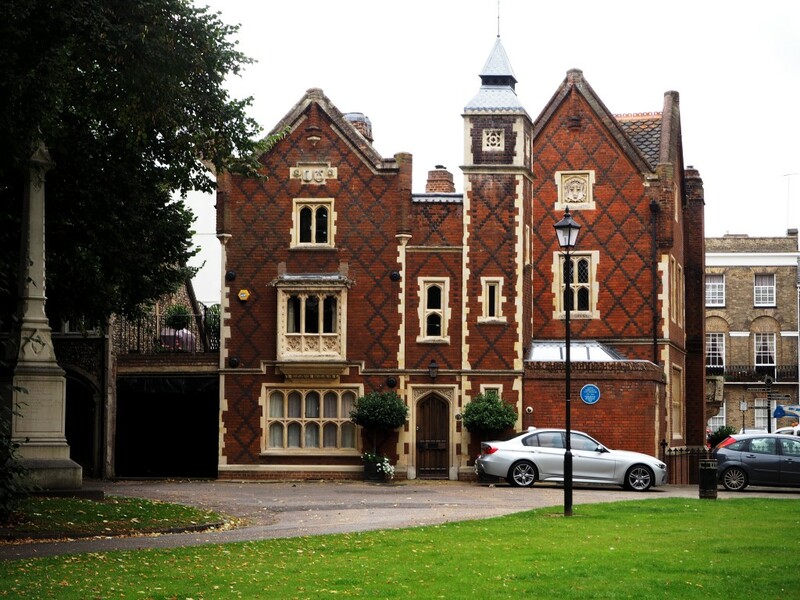 Next to the Norman Tower is an impressive red-brick Victorian Gothic revival building. Designed by architect Lewis Nockalls Cottingham (1787 – 1847), this was the Savings Bank House and built in 1846. 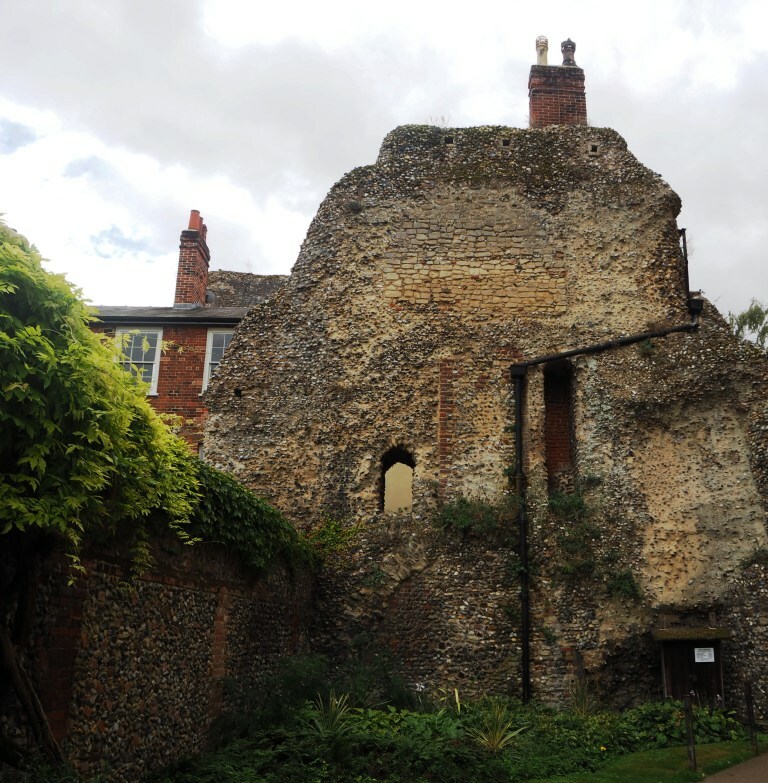 This is just a tiny part of Bury St Edmunds, a town that is deserving of a lot more exploration. For instance it has the only surviving Regency theatre in the country and is open as a National Trust property between May and August and has a programme of performances the rest of the year. There is a street market in the Buttermarket and Cornhill which has been held for over 1000 years and in May they hold an arts festival. Latin for “Shrine of a king, cradle of the law” – which combines the town’s links with Edmund and the Magna Carta. 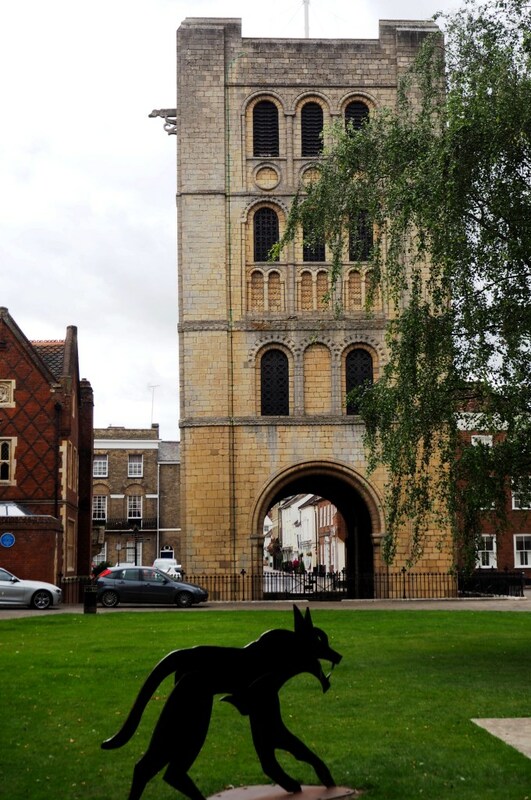 Legend has it that the barons responsible for the Magna Carta met at the shrine of St Edmund in 1214 to swear an oath that they would force King John to accept their Charter of Liberties, later to be known as the Magna Carta. How interesting to see the old walls incorporated into the “new” buildings. The display of pink flowers in your first photo is simply beautiful. Those pink flowers were certainly eye-catching Carole. I haven’t been there since the 70s, but by coincidence, Julie and her daughter went to the Christmas Market there last Saturday. Julie had never been before, and came home raving about what a wonderful place it was. She is keen to return, so I will probably accompany her, in better weather. We didn’t get as far as the shopping area, but from what we did see it looks like a nice town. We wouldn’t mind going back at some point. I think we stayed overnight but I couldn’t tell you where. We had the brolly up most of the time and I remember running past that gate and through a covered market into the ‘smallest pub in Britain’. It had no loo so after too many halves of Guinness it was tappy lappy back to the market and the loos. Several times! (well, it wouldn’t stop raining 😦 ) Not quite your experience! 🙂 Your photos of the Abbey remind me of Norwich, though that’s grander. I’d have loved a better look around the ruins but I was young and daft(er) then. 🙂 Thanks for the lovely not quite memories. Wonderful, wonderful walk and tour. Love the architecture. Gives me goosebumps talking about building constructed so long ago. In Canada, we don’t have as many old structures. It’s quite amazing how many of these hundreds of years old buildings are still going. I’ve driven past Bury a few times, on the long road east, but never stopped. I wish I had now! Wow, Jude! These tours you take blow me away – just the depth of history alone is almost beyond my imagination. In today’s post I’m obsessed with the photos of the “gates” … so much more than your standard ‘gate’. I’ve been trying to plan a trip for next spring and I’ve been inspired by your posts. Originally I had wanted a hiking trip to Scotland, but then you seduced me with the coastline of Wales, then Cornwall, and now the east coast with so much history to explore. I hadn’t realised this was your old stomping ground. A beautiful area. Did you see my Lavenham posts? Very recent Sherri, just go back a week or two. Great…hope you enjoyed it! 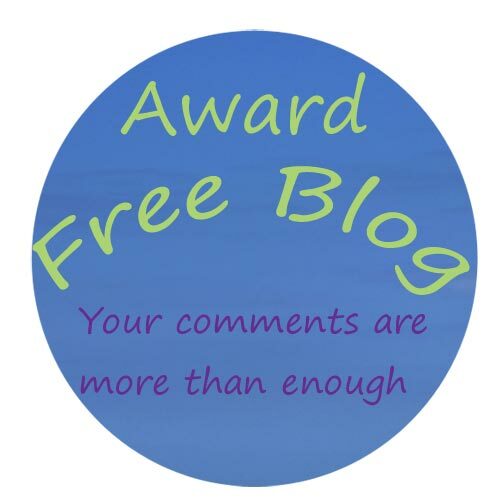 I’ll head over there to catch up with your posts asap!